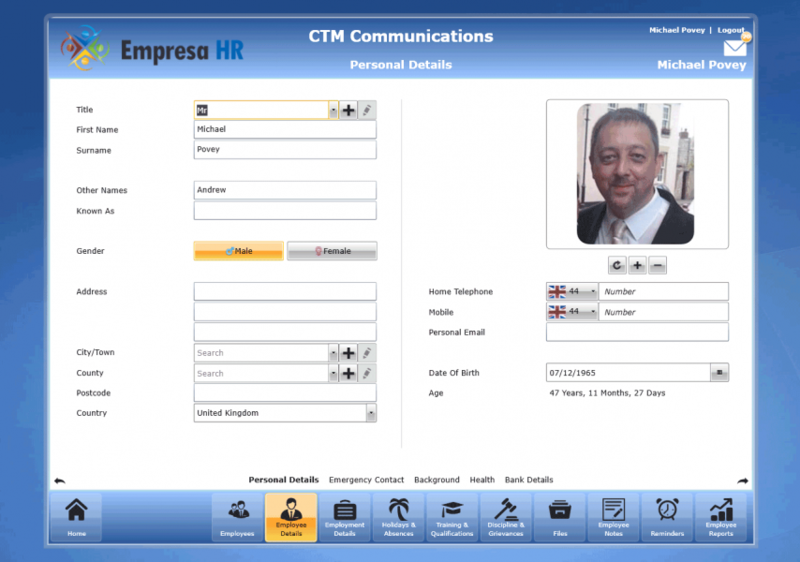 Empresa implements a centralised, searchable employee directory allowing HR to quickly identify the staff records you are searching for. Employee profiles are fully customisable with highly visible permission settings. Empresa charts your organisation based on the reporting relationships you identify for every employee in the system. HR can gather a visual representation of departments and heads via photo galleries. Quickly find and manage employee's personal information. Allow your employees to update their own personal information (fully customisable by configuring user roles and permissions). Names, address, D.O.B., age, photo, telephone, mobile, Email address and emergency contacts. National Insurance number, marital status, Dependants, nationality, ethnic origins, religion, passport details, immigration status, immigration document verification and DBS information. Doctors name and contact information. Disability information (as defined be EA 2010). Record any special requirements to allow a role. Additional health notes log. Bank name and address. Account name, sort code, number, IBAN and SWIFT/BIC. Ensure job applicants is allowed to work for you in the UK before you employ them.